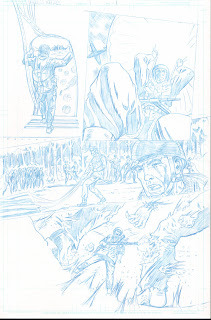 The pencil 1st page of Hell's Nazis. Looking forward to inking it, which hopefully, will be very very soon. and I'll be gutted if'n I can't match the look that's rattling around in me head. It'll be great don't worry. The only thing that'll make it look modern is being printed on decent paper instead of the bog roll they used for Warlord! this is a killer page, gary. bold, swooping and dynamic storytelling - best of british with those inks. I've got every dangly bit crossed that I do a halfway decent job.